Siouxland Fabrication Inc. is a complete fabrication job shop. Going from prints to finished assembled products, they do it all. Started in 2004, Siouxland was already an experienced fabricator and they continue to run on experience. Siouxland has a variety of Mazak lasers, totally eight different lasers all in some sort of automation cells ranging from configurations with one to three machines in each cell. Siouxland was looking to increase capacity and enter into the light gauge market. 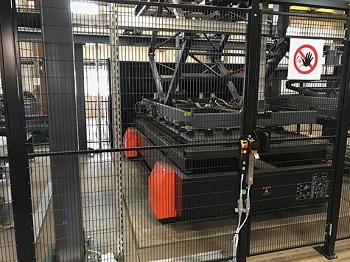 Their decision was to upgrade to a Mazak OPTIPLEX 3015 DDL with a LASER FLEX automation system with tower, unloading to the floor and shuttle cart. Originally the plan for the OPTIPLEX 3015 DDL was to process material under 0.250” because of the speed capabilities that the direct diode laser technology has. Siouxland has proved that the OPTIPLEX DDL out cut three of their previous CO2 lasers. Direct diode laser cutting speeds are higher than conventional CO2s or fiber laser generation systems for thin and medium thickness sheets including highly reflective materials. A shorter wavelength and higher heat absorption supports faster processing while energy conversion efficiency is four to five times that of a CO2 laser. Siouxland knew that the DDL had better edge quality than a fiber laser but they have discovered that they are saving 30 percent in total process time in thick plate due to the Mazak torch’s advanced piercing technology alone. “You can tweak the machine and push it to see how fast it will cut and still maintain quality,” says Boogerd. “Operators find the feed rates amazing. Prior to automation we were getting eight more hours of cutting time per day. With Mazak’s LASER FLEX that number has jumped to 20 additional hours of cutting time a day. Our throughput has realistically doubled with processing time cut in half.” Siouxland Fabricating cuts approximately 1500 tons of sheet and plate a month. Like most companies, Siouxland grapples with short lead times. 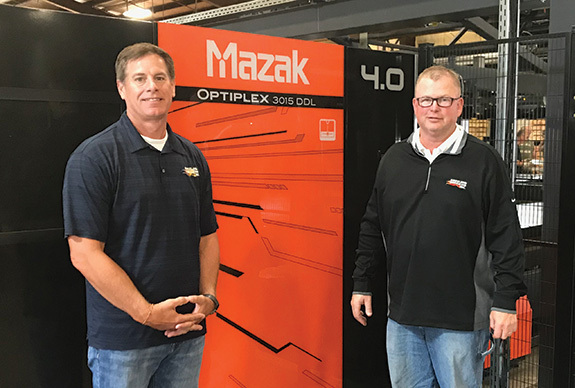 The OPTIPLEX DDL with LASER FLEX automation gives Siouxland the flexibility it needs to adjust to fluctuating market conditions. Siouxland is moving full-speed ahead on automation and sees additional OPTIPLEX DDL laser and robots in its future. Full article written by Lynn Stanley and published in the September issue of FFJournal.